For an example, for those of you who still might be on the quest for the holiday outfit, here’s a few of my favorites on Etsy, with what I imagine they could be worn as. A fabulous red and green plaid suit. The “I want to be Marilyn for Christmas” dress. The fun Christmas fairy dress. The Holiday Rock Star dress. The How to Marry a Millionaire Christmas dress and bolero. The college sweetheart formal dress. The depression era home style Christmas dress. It’s times like these I’m thankful I can sew for myself! I thought I found the perfect fabric in the form of Michael Miller’s “Holiday Hostess”, but my quest found it not only discontinued, but I only have 7/8 yard of it! Perfect holiday apron, at least! As a last resort, thinking maybe I could make a red and white striped dress like the gal’s wearing, or maybe some nice red velveteen to make a dress I’ve got a pattern for in my stash, I stopped into our local fabric store- mostly like a discount fabric store. Although I didn’t find either I set out for, I did find a lovely wool blend that jumped out at me from the shelves- at it was 50% off! There was even some red wool blend to use for contrast. Score! I’ve had this pattern in the “to trace off and then sell” pile for a long time, and now I have the perfect excuse to do it! I’m still not 100% sold on it for this fabric (read: I don’t really know if I bought enough to match the plaid on the bodice, or am certain I want to take the time to make a tailored dress) but I think it would be absolutely dreamy as a Christmas dress that, thankfully, could be worn year round! I even got a covered button kit to make the buttons red. So we’ll see what happens! 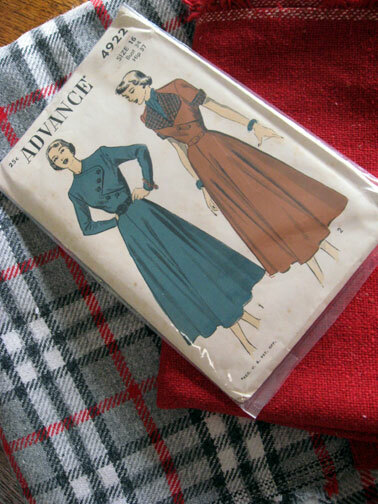 Hopefully I can squeeze in the dressmaking project between now and Christmas! >Wow, cute pattern!! I hope you have enough time to make it! >Great links! And I hope you have time to make the dress too! >Loved the links! Hope you find time for your Christmas outfit! >that was fun! thanks ;)and omg you are ambitious!! >Have you seen http://www.fabricparadise.com? I warn you it is terribly addictive. The lovely Elka said she has heaps of stock and is usually far enough behind in getting it loaded that she often has discontinued stock. I is worth emailing her if the one you want isn't listed. You can search under theme or the designers name. I always end up a few hours and quite a few $$$ worse off! >I adore the links you posted. So fun and cute! I can't wait to see your new creation. I'm thinking I will wear Regency for Christmas this year :-) God Bless!